Today we have a guest post from Jacob of The Cash Cow Couple. If you’re interested in submitting a guest post, please check the guidelines on our contact page. Over on our blog, my wife and I frequently talk about the joy we’ve found in spending less than $12,000 in our first year of marriage. Spending so little started as a challenge, but resulted in a way of life. There is something extremely rewarding about our experience. It reaches far beyond a full bank account and into something much bigger. It touches on the importance of discipline and restraint. It forces us to evaluate our lives and our habits. I would encourage everyone to actively attempt to reduce spending. There are numerous benefits outside of dollar bills, but the biggest motivator for many is likely to be the idea of financial freedom – or that magical point when passive income covers all living expenses. The ability to choose your career decisions is huge, especially for those who don’t enjoy their current employment situation. The path to financial freedom can take many forms. I’ve known people from all types of backgrounds and careers who have been able to master their finances and make career decisions without fear of financial distress. Almost all of them have something in common, they’ve learned to spend far less than they earn. You have to forego spending today if you want to accumulate wealth for tomorrow. Today I’d like to offer a few ideas on how you can spend less money today, so that you might have more tomorrow. Did you know that the average American spends more than $1,000 per year eating out at lunch? Dinner is even more expensive. That’s insane. Learn how to cook meals at home and take them to work the following day(s). I haven’t eaten out at lunch in almost a year. I bring my lunch every single day. It saves a ton of money and also results in higher quality food. For buying groceries, learn how to price match the weekly sales at Walmart. We do this once per week. Don’t listen to the bank when they offer you a mortgage loan based on 30% of your gross income. That’s too high. far too high. Buying a home can definitely make sense, but only if you are going to stay put for 5-6 years. Beyond that, keep costs down. You don’t want to have a mortgage payment up to your eyeballs that continually stretches every paycheck. Consider something smaller and something that can be improved with a little hard work. A small housing payment can really crush cash flow. And don’t buy into the idea that a home is a great investment. Housing prices have historically followed inflation, which is far less than the stock market. And you’re continually paying interest on the outstanding loan. My wife and I share a 1996 Saturn that gets 30-40MPG. I ride the bus to and from work/graduate school and she commutes about 15 miles roundtrip to work. We carry liability only insurance and drive as little as possible. We would love to go car free but that’s currently not possible. How about you? 2, 3, 4 cars? Is it necessary? Is the constant stress of rush hour driving killing you? Research says it might be. How about the upkeep, gasoline, oil, wear and tear? It all adds up to thousands per year in costs. Not to mention the fact that cars do little beyond depreciate. In our case, the depreciation is gone. I bought it 4 years ago for $1,700 and could get $2,000 today without a doubt. Try to find ways to lower your automobile costs. Ah, what freedom a bicycle could bring! Once you’ve been actively saving, you’ll find some free cash flow. Over time, this cash tends to accumulate and either get spend or invested. I recommend the latter. Don’t stick that money in a local checking account earning 0.05% interest. If it’s short term money, consider a high yield savings account. Ours is currently paying closer to 1%. For longer term goals, you have to consider the stock market. I personally choose to invest in well diversified ETFs and I would recommend you do the same. There are many reasons for this but probably the most compelling are tax efficiency, excellent diversification, and extremely low fees. You have several fantastic investment options that you should consider. Vanguard allows many ETF trades for free. Motif Investing allows you to choose up to 30 ETFs or funds and pay a flat $9.95. Or you could let a company like Betterment invest your money for you. They use Vanguard ETFs and charge a crazy low fee of 0.15% to handle everything from dollar cost averaging to tax loss harvesting. After you’ve made a few investments, you need to track them. You have to always know what you’re paying in fees and what your asset allocation is. To track my investments, I always use Personal Capital. It’s completely free and extremely helpful. I hope you’ve enjoyed my thoughts. 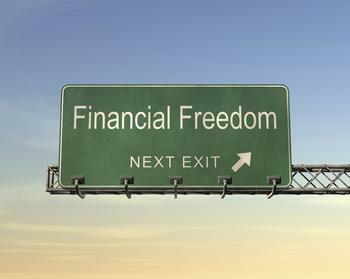 Do you have any additional tips on achieving financial freedom? Author Bio: I’m Jacob, one half of the Cash Cow Couple. My wife and I enjoy teaching others how to live an abundant life on a very modest salary. We are attempting to spend less than $12,000 in our first year of marriage because we truly believe that less is more! I like how to outline and shared your tips, obtaining financial freedom is a change of mindset. Including what you shared about discipline and restraint. Great advice! My husband and I have each been driving the same cars that we’ve had since college- they are 13 and 15 years old and run great. We joke that we could never get rid of them because they are worth far more to us than anyone else! Controlling transportation expenses is definitely a biggie and can have a big impact on finances. Transportation is so expensive after factoring in insurance, gas, oil, repairs, taxes, etc. Great tips. Accumulating wealth is in large part about financial choices and spending within reason is a key one. We are in a 2 BR, 2 BA mobile home, so it’s not too big (or expensive). We want to get a nice small house for out next move! Taking control and not overspending is very difficult for many people who have taken out too much debt. Helping them to reduce this burden is important and it is so easy to judge people, it is so much better to share experiences and positive steps forward, which this is why it is such a great post. These are definitely the heavy hitters…some of them are harder to control on a day to day basis however. Food cost is something that you can let explode from week to week, and something that my wife and I strive to keep under control. I think they are easier to control if you decide beforehand what to spend and change your mindset to minimize spending. Housing and cars are probably the 2 biggest expenses people have. Food comes in a close third. By just focusing on these 3, you can make huge improvements to your finances. Great post! Thanks Jon, couldn’t agree more!